Flavours often evoke fond memories of travel experiences. When back from an amazing trip one tends to reminisce not so much about the sites but rather the feasting. Such is an island like Cyprus that has nothing to envy when it comes to food and wine. An abundance of organic produce, plentiful wild herbs all effortlessly growing at one’s backyards or at family cultivated fields is the base for hearty dishes. Blame it on the sun or rich soil, traditionally the island offers a varied palette of flavours, based on rather simple concoctions of whatever each season offers. My best treats are during wine harvesting season when, besides robust wine, Cypriots create the famous palouze (a creamlike mixture of grape juice) where they deep strings of almonds hanging them later in the sun to dry. It’s funny but when packaged ready to be sold in the marketplace they look like explosives! 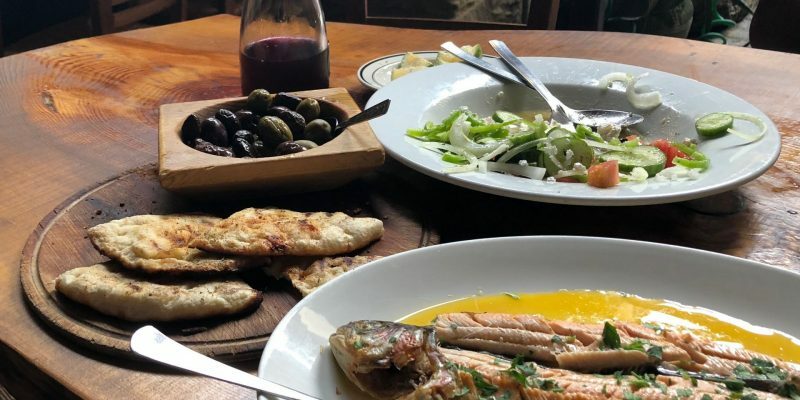 The much talked about Meze is now days left to the imagination of each tavern owner and dishes tend to vary depending on the location and traditions. One certainly needs a big appetite to try all small plates from dips, to olives to salads, to casserole specialities and a variety of grilled meat. The showstopper is always though the halloumi (goat cheese) which can be presented in all ways possible and tastes as exquisitely each time. Being a vegetarian it’s ever so easy as vegetables taste fabulously decadent when mixed with extra Virgin olive oil and simmered to perfection always served with an irresistible loaf of sesame bread. Our island is yet to be discovered for its amazing culinary diversity, but it surely deserves a visit just for that. Get in touch with us for your next gastronomic experience in Cyrpus.